In glass buildings, energy transmission through glazing significantly affects the comfort inside the building as it either raises or lowers the room temperature. Such transmission may occur during summer as well as winter and also during day and night. Thermal comfort is influenced by radiation through glazing, making it excessively hot during summer and excessively cold during winter season. Therefore, glazed areas in buildings are to be designed considering overall energy balance in relation to the effects on the thermal comfort of the occupants and the total energy implications of heat gain and heat loss during the year. Solar control glass is widely used for altering energy transmission due to radiation. Safety is another important factor to be considered in glass building at all the stages from selection to installation. Even though glass is a highly brittle material but with certain modifications, its brittleness can be altered to such an extent that it qualifies for fire resistant, heat resistant, impact resistant, and even bullet resistant material. Adhesive backed polymeric safety/security films are also available which modify breaking characteristics of glass when pasted on it. Bird hitting the glass is another issue which needs to be addressed particularly in large windows and multi-storeyed buildings. Solar Control Glass Solar energy transmittance in the glazed surface comprises of direct transmittance and indirect transmittance by way of solar absorptance. Therefore, orientation, shading devices, glazed area, and properties of solar control glass influence it largely. The function of solar control glass is to reduce the total solar energy transmittance. Solar control glasses are manufactured in several forms. However some tints and coatings are also able to attenuate preferentially non-visible solar radiation, leaving the transmission of the greater proportion of the visible radiation largely unchanged. The application of ceramic frit fired on the sur face of glass also modifies energy and light transmission of glass. Some solar control glasses can be toughened or heat strengthened for ensuring safety from thermal fracture. Solar control glass can be used in single or double glazed units depending upon the requirements. Common varieties of solar control glasses include the following; i. Body tinted glass ii. Reflective coated glass iii. Laminated glass iv. Insulating glass unit Advantages of reflective coated glass are greater performance range than body tinted glass, light to energy ratios nearer to the theoretical limit, and range of colour appearances in transmission and reflection. Laminated glass with clear interlayers and solar control glass exhibits similar properties to the solar control glass from which it is made and with tinted interlayer acts similar to body tinted glass. Energy loss is quantified by the thermal transmittance or U-value. Glass and thin plastics glazing sheet materials are poor insulators. Increasing the thickness of the glass or plastic glazing sheet materials makes little difference to the U-value. Therefore, IGU are used for improved thermal transmittance which can improve total solar energy transmittance since the air cavities provide extra thermal resistance. Further, use of low emissivity (low-E) coatings on glass improves the thermal insulation. When used on the cavity surfaces of IGU, such coatings are most efficient. In case, cavities are filled up with inert gases like argon or krypton or with cellular materials in case loss of vision is acceptable, they further improve thermal insulation. Safety of Glass Safety of glass is considered for thermal fracture, fire, wind, seismic forces, and human impact, including handling, transportation, storage and installation. Thermal safety of glass Thermal safety of glass should be assessed considering the amount of radiation incident on the surface and the thermal capabilities of the glass. For example, the solar radiation intensity on the glass surface should be determined along with the air temperature range applicable to the location of the building. These measurements, together with the energy transfer coefficients and the glass absorption allow determination of the appropriate basic temperature difference between the central area of the glass and its edge. The difference is related to the thermal stress and then modified for the type of glazing system, taking account of extraneous effects resulting from curtains, blinds, back-up walls, proximity to heaters, etc, to derive a stress of actual service conditions. Since the breaking stress of the glass is mainly dependent on the extent and position of flaws in the edges, condition of the glass edge is therefore extremely important. Solar control glasses should not be nipped to size, and any panes with shelled or vented edges should not be accepted for glazing in orientations subject to direct sunlight. Necessary precautions are also to be taken during storage, and handling to avoid damage to the edges. Fire and loading Glass has to be designed for fire safety, wind pressure and seismic loadings. Fire resistance glasses include annealed fire resistance, tempered fire resistance, intumescent laminated fire resistance, and double glazed fire resistance glasses. Since these glasses are not distinguishable from normal glasses, they need to be tested with complete glazing assembly like frame/edge cover, gaskets and fixtures as they have equal role in the fire safety. Fire rated glass assembly must withstand the standard time during fire and give adequate time to the occupants for safe evacuation. Fire rated glass must also provide sufficient amount of human impact safety even during fire. Wind pressure is another important parameter to be considered. Apart from the wind pressure of the area, wind pressure gets increased due to Ventury’s effect in case of constricted area due to high rise buildings leaving little space between them. In general the wind pressure depends upon location of the building, construction pattern around buildings, topography of the site, and building plan and its height. The thickness of the glass is prescribed in NBC 2016 for certain conditions like ultimate limit state wind pressure up to 10kPa, modulus of elasticity of about 24 MPa and Poisson’s ratio of 2.5 for laminated glass having equal thickness of two sheets and polyvinyl butyral or equivalent type of interlayer, and designed flexural tensile strength obtained with minimum factor of safety of 2.5. Minimum design strength of normal glass for thickness up to 6mm is 16.7N/mm2 and for thickness above 6mm as 15.2N/mm2. The following design consideration is made in determining the thickness of glass of rectangular panels properly secured in case of normal, reflective, laminated, tempered and insulated glass; i. Maximum area of glass panel to be restricted to 15m2 and maximum span of window to 4m. ii. Aspect ratio of the glass panel should be greater than 1.5 else next higher available thickness needs to be selected. The principal design criterion for the seismic design is that the structure remains elastic during the designed seismic conditions. In all the conditions, it is to be ensured that the accident due to human impact is avoided or at least reduced even on breaking of glass for which safety glass is used. Safety glass is a glazing material treated or combined with other materials so as to reduce the likelihood of injury to persons by objects from exterior sources or by these glasses themselves when they crack or break in comparison with ordinary sheet, float or plate glass. Though safety glasses can break, their breaking patterns reduce the injuries to a great extent. Such glasses have different breaking patterns as per their manufacturing processes. Safety glass may be toughened (Tempered) safety glass or laminated safety glass. Toughened (Tempered) safety glass is a single piece of specially heat treated with a stress pattern such that the piece when fractured reduces to granular fragments, with no large jagged edges. It breaks and disintegrates into small and relatively harmless particles. However thick toughened glass particles may stay interlocked and fall as lumps of these multiple particles and can cause a minor or medium injury mainly due to the weight of the cluster. Safety glass can be flat or curved and of any type which includes clear, tinted, coated, frosted, decorative or mirror. If Insulating Glass Unit (IGU) is installed in areas subjected to human impact on either side then both the panes of the unit shall meet the safety requirements and in situations where access is restricted to one side of the unit, then only the accessible side should meet the requirements. To avoid broken glass falling on people from a height, threefold action includes use of safety glass, removal of broken glass pieces immediately, and adopting architectural design following the safety standards given in the NBC. It is to be remembered that all heat strengthened, laminated, toughened, coated and annealed glasses are not classified as safety glasses unless they meet the test requirements of the safety glass. Safety glass is to be used in locations where the risk of people getting hurt by falling glass is high. Adhesive backed polymeric safety films to a glass substrate can modify the breakage characteristics of the glass pane to which it is applied including additional benefits like reduction in heat and solar radiation, and UV blocking etc. They are used as internal and external glass panes of buildings where there is a possibility of injury from broken glass. These films provide safety against dangerous glass splinters which may be generated during glass breakage. Security films to a glass substrate provide resistance to manual attack, explosive pressure, ballistic attack and resistance to attempted forced human penetration with tools such as hammers, screwdrivers, stones etc. Additionally, they modify the spectro-photometric properties of the glass substrate and breakage characteristics, and help in reduction of heat and solar radiation. These films are preferred at places where solar radiation control combined with safety and security features are required. Safety during handling, transportation, storage and installation Safety in glass is also to be considered during handling, transportation, storage and installation also. During handling, glass is to be handled with dry clean gloves specifically after washing to prevent stain marks, and care taken to avoid contact of the coating/enamel/printing side with any rough surface. During the transportation of the flat glass, solar control and mirror, lacquered or painted glass, glass is to be transported vertically, glass panes not allowed to come in contact with each other by using interleaving layer of foam or paper, and the packing protected from water and other operations. Glass and coating layer, if any, should not be exposed or remain in direct contact with aggressive chemicals such as acid, solvent, cement mortar etc. To prevent staining, the storage area should be dry, well ventilated at a sufficiently constant temperature, protected from rain and running water, alkaline materials, and direct contact of aggressive products, and the glass panes need to be stored vertically. The fixing system of the panel should in no case cause shear stress in the panel. The protection of glass can be made by means of polyethylene sheet which provides ventilation to prevent thermal breakage. Safety due to reflection When glass façade is used in the solar direction getting maximum heat, effect of reflection has to be considered for the safety. If concave façade is used, problem is more likely to be aggravated on opposite side of the building. In such circumstances, sunrays hit the external glazed surface, get reflected due to concave surface, and focused on small area on the ground or any other surface generating large amount of heat. Also focal point will change as the sun moves. An incident was reported in London where a car melted due to heat from the reflected sunrays (called death rays) from a multi-storey office building. Safety related to human impact Safety related to human impact is also essential to avoid accidents due to human impact. Therefore, it is to be ensured that glass does not break under most likely forms of human impact, and if it breaks, the likelihood of cutting or piercing injuries are minimized by giving protection to glass or limiting the size or fracture characteristics. Precautions for human impact are also to be taken to reduce the injuries from glass breakage by selecting glass of suitable type, thickness and size, making glass visible, and minimizing manual handling of large pieces during installation. 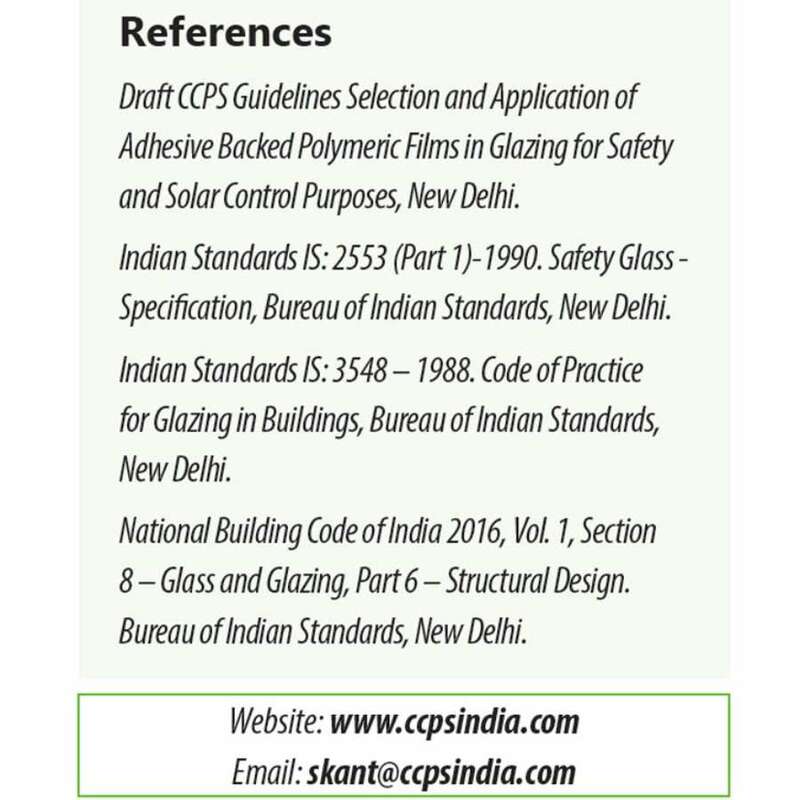 Critical locations are specified in CCPS guidelines on use of glass in buildings, clause 7.3, section 8, part 6 of NBC 2016 and IS: 16231 (Part 4). Safety for birds Birds hit the glass being a transparent material, not realising it being a hard surface, called bird hitting. Bird hitting is possible during daytime as well as night time. During daylight, birds crash into glass windows because they see reflection of vegetation or indoor potted plants/vegetation from outside not anticipating hard surface. During night time, birds collide due to lighted windows. Sometimes birds also hit windows/glass by chance or even by seeing their own images in the glass and attacking on them. On colliding with glass, most of the birds die due to impact as shown in the photos. Bird hitting on window To make windows safe from bird hitting, one has to examine the windows whether vegetation, foliage, trees or any other feeder source is visible on glass which can attract birds and if so, how glass can be made safe and bird friendly. To avoid bird hitting, vertical and horizontal marking technique can be applied on windows in the form of strips, paint, stickers, or tape on outside surface or curtains blocking the visibility provided they remain on the windows during daytime. Closely spaced strips, screens, mosquito nets, solar films also act as deterrent due to creation of partial opaque surface. Concluding Remarks Office and commercial buildings having glass facade necessitate indoor thermal comforts. Therefore, glass has to be selected considering thermal transmittance, reflection, and thermal and fire safety. Also safety is very vital in selection of glass, handling, transportation, storage and installation. Glass has to be safe from thermal fracture, reflection, fire, wind, earthquake and also human impact criteria. Therefore, glass is to be selected based on design and tested before use to avoid accidents.